Shoulder pain, injury, and stiffness are very common among people nowadays. This makes it irritating and frustrating to carry out daily tasks or sleeping comfortably. This can be due to end number of reasons like Tendon inflammation, wrong sleeping position, injury, instability, unsuitable pillow, Arthritis, and Bone Fracture. In case the shoulder pain stays for long, it is highly recommended to consult an orthopedic doctor. Researchers found that a wrong sleeping position twists the shoulder muscles in a painful position which hampers the spinal alignment. There are many potential causes of severe shoulder pain which leads to sleepless nights, but the most familiar reason for shoulder pain are rotator cuff tears, rotator cuff injuries, and osteoarthritis. The rotator cuff is a combination of four muscles and tendons that enclose the shoulder joint, and fix the shoulder blade to the arm bone. Bursae, tiny bladder close to the joint, offers lubricating fluid that reduces friction among the ligaments, bones, and tendons. Rotator cuff injury occurs due to overuse, and they consist of tendonitis, partial, strains and total tears of the tendon. Use of the wrong pillow under the neck or shoulder worsens the pain by making it more severe and putting strain on the rotator cuff. Tendonitis occurs when the rotator cuff tendon tends to be irritated and inflammation occurs when the bursae swells. Bursitis and Tendonitis cause pain in the side and front of the shoulder, and one feels a weird kind of stiffness. Make use of suitable pillow matching with the structure and sleeping position. This eases the shoulder pain to a great extent, making it relaxing and more comfortable to sleep and rest. The physicians recommend Orthopedic Contour Memory Foam Gel pillow for people with shoulder pain. Shoulder pain is really frustrating when it leads to sleepless night due to severe pain. This pain keeps us awake for the entire night leading to a tearing in rotator cuff tendons. You also might have an injury if it makes it difficult for you to lift your own arm smoothly with rigorous pain. You also feel the weakness in your shoulder while lifting. These sometimes are due to the wrong sleeping position and wrong choice of the pillow. Therefore, the best therapeutic therapies are proper rest, avoiding annoying activities, applying ice, bodily therapy, use of right supportive pillow and NSAIDs. 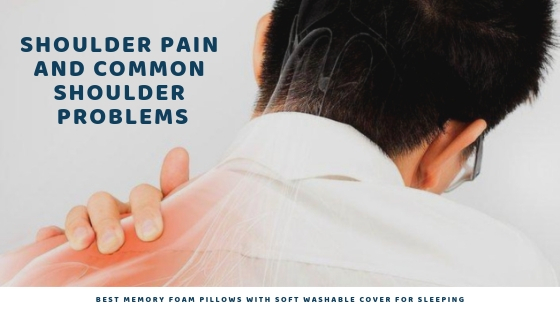 Orthopedic doctors advise shoulder pain patients to always use Memory Foam Pillow with infused gel for better air circulation and premium support. Osteoarthritis occurs when cartilage that covers the ends of the bones weakens and leads to stiffness and pain. Osteoarthritis causes severe pain in the shoulder. As osteoarthritis worsens, there is stiffness in the shoulder. People with osteoarthritis also lose the capability typically to reach behind their back. For some people, injury to shoulder from sports or some other physical activity may kick off the degenerative process causing osteoarthritis. People with osteoarthritis shoulder pain find it helpful to use Bamboo Memory Foam Pillow with Shredded foam. This pillow is the Eco-friendly, hypoallergenic and acts as a pain-relief solution to severe pain. Shoulder pain is really common among all age groups which also leads to many other sleep issues. The orthopedic pillow with a supportive surface that suits a specific sleeping position helps in relieving the shoulder pain and offers a relaxing surface to sleep on. Sleepsia is a reliable brand delivering top-quality memory foam pillow across the USA. To purchase Sleepsia products, simply visit the official website www.sleepsia.co, identify your choice and place an order for the best pillow that suits you or call at 1800-862-1084 in case of any doubts or queries. The delivery process is customer-friendly & hassle-free with proper information provided for each product.